How should you handle your growing email archiving issues? According to ESG (Enterprise Storage Group), the number of organizations using a SaaS-based email archiving solution has increased 350% in the past three years. It's not a question of if you should archive email, but how - and, the evolution of SaaS solutions makes sense to move email management to the cloud for a broader range of organizations. 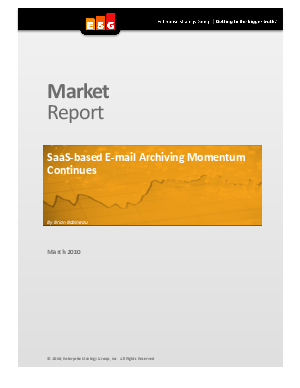 Read this new report, "SaaS-based Email Archiving Momentum Continues", by Senior ESG Analyst, Brian Babineau, to learn about how: •Medium-size business (100-999 employees) can benefit from e-mail archiving just as they have from other message management processes such as anti-spam and anti-virus •Software-as-a-Service (SaaS) solutions make it easy for medium-size organizations, which typically have limited IT sources, to get started with e-mail archiving"